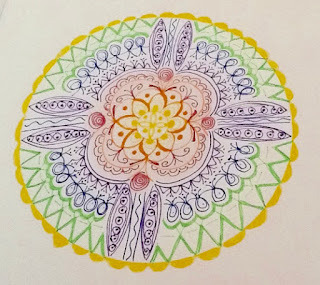 Hannah Designs Here: What is a Mandala? 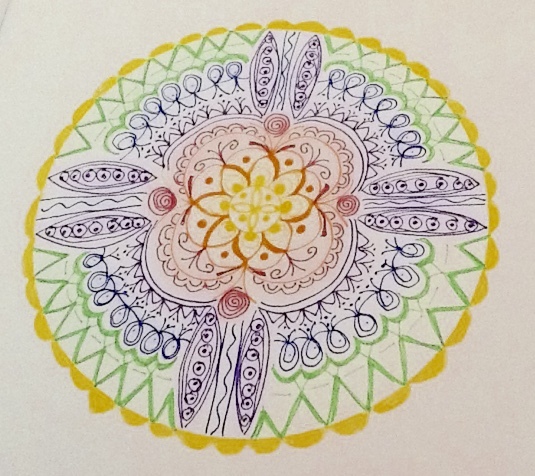 A Mandala is a representation of a circle. The translation for mandala, from Sanskrit, is circle or cycle. It can be seen as the organisation and cycle of life itself around a unified centre. The universe is created in the mandala, sometimes it has seven layers, representing the seven chakras from yoga, or the seven days it took God to create life. As a circle has no end and no beginning it can show as a journey with infinite possibilities and no end or beginning. 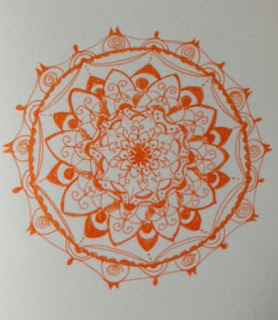 Not only is the process of creating mandalas seen as meditative, but the viewing too. A decorated circle with journeys for the mind’s eye and so many choices on what to view next, offer an alternative to a seated silent meditation. The perspective of seeing different paths and understanding our life’s journey through the infinite visual stimuli in a mandala can become a daily practice. Tibetan Monks, to this day, are taught to create mandalas from coloured sand. Four years of training is considered necessary before being allowed into the team which creates the mandalas. Mantras are chanted and meditations are practiced while construction of the mandalas takes place over sites which have been blessed and cleansed beforehand. 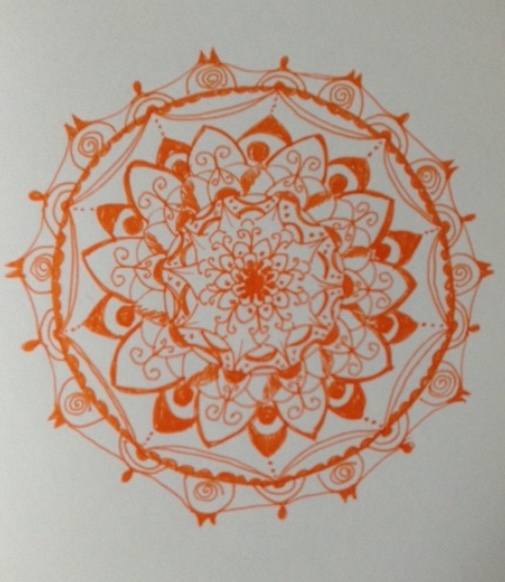 These mandalas are believed to have healing properties for all who create and view them. Essentially they are made in an open place for the wind and rain to wash away the final creation. Life has infinite possibilities, but a new door will open, with a new mandala once the old door and old mandala has been closed. Mandalas are created with various materials throughout many religions and cultures and are documented at many points in history. In the modern world we see most mandalas as artwork, on paper or in paintings, but they are also seen in fabrics, architecture, furniture and hi-tech product design. A mandala created by us in any of these forms can be seen as a connection between our inner consciousness and life around us. Such creations become a way of looking at how we feel every day. The colours we choose can become significant, connected to the chakras or our surroundings. The shapes, lines, curves and dots that we use can represent the world around us or the thoughts and emotions we are experiencing. Having that short break and finding a focus will make a difference to how you continue your day. The repetition of thought and motion of colouring or drawing has been shown in studies to be soothing and calming for the brain. There is no coincidence that adult colouring books are sold as ‘mindfulness’ books. Mindfulness is a long established type of yoga practice, basically meaning to focus on one thing without distraction, which for even three or five minutes a day will make a beneficial difference to your emotions, energy, mind, body and spirit.